Apple CEO Tim Cook and China Mobile Chairman Xi Guohua pass out autographed iPhones in Beijing. China Mobile started selling iPhones on Friday after years of feverish anticipation and protracted negotiations with Apple. Apple CEO Tim Cook marked the occasion with a trip to a China Mobile store in Beijing, where he and China Mobile Chairman Xi Guohua handed out autographed iPhones to customers. Partnering with China Mobile (CHL) gives Apple a needed boost in China, where it has has been losing the smartphone race to competitors offering cheaper options. The deal expands Apple's footprint in the world's most populous country, boosting its potential customer base by 700 million -- more than twice the population of the U.S.
"China is a very, very important geography for Apple, not only for its size, but for many other reasons as well," Cook told reporters Wednesday in Beijing. 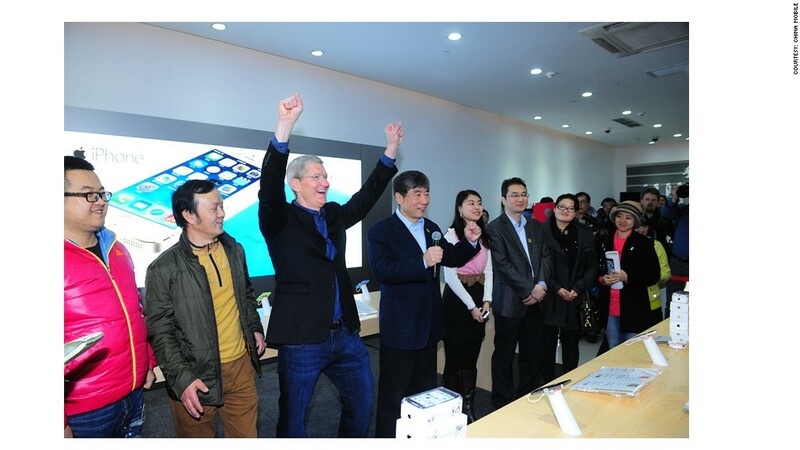 Cook was also effusive in his praise for China Mobile and its chairman. "We saw a company in China Mobile that was unlike any other company we had ever dealt with, that had enormous skill and enormous size and enormous scale and enormous talent," Cook said, according to a transcript published by the Wall Street Journal. The two companies said they have already received more than 1 million pre-orders for the iPhone. 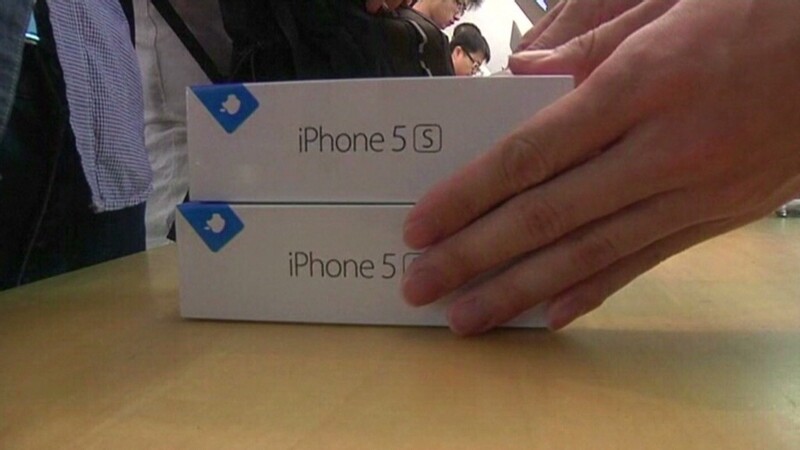 On Apple's China website, a 16 GB iPhone 5s is priced at 5,288 yuan ($874) and a 16 GB iPhone 5c costs 4,488 yuan ($742). The price tag should be lower for China Mobile subscribers, depending on the subsidies offered by the carrier. Analysts have estimated Apple (AAPL) could sell as many as 24 million iPhones this year through state-owned China Mobile, although others think the number will be closer to 10 million. Until now, Apple has only been able to offer the iPhone through China Mobile's smaller competitors, China Unicom (CHU) and China Telecom (CHA), which have about 425 million subscribers combined. Having access to state-owned China Mobile's large subscriber base is expected to be lucrative for Apple, but the company still has a long way to go in China. The iPhone remains costly compared to smartphones produced by rival firms like Xiaomi. That point was reinforced during a visit to another China Mobile store in Beijing on Friday, where a woman named Wang, who didn't give her first name, said the phone is too expensive. "I haven't thought about buying an Apple," she said. "There are so many Chinese brands and I can pick a model based on my income." Apple also lacks the app store advantage in China that it has in most other countries, as the government censors many offerings on Apple's iTunes App Store, and Chinese customers haven't proven willing to spend money on top-tier apps when they can get free knockoffs. That has pushed Apple into fifth place in China with just 6% smartphone market share in China, falling behind Samsung (SSNLF), Lenovo (LNVGF), Yulong and Huawei, according to Canalys. But Cook is perhaps interested in more than just smartphones. "Apple and China Mobile can do a lot more things together," Cook said. "I really see today as a beginning, not the end. Our work just begins." -- CNN's Dayu Zhang and David McKenzie contributed reporting.